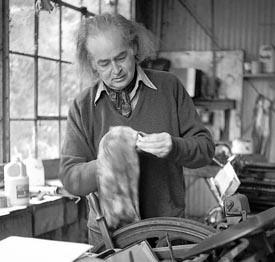 A renowned publisher, poet, painter, and UCSC lecturer emeritus in creative writing, Hitchcock died last August at the age of 96. His longtime partner, Marjorie Simon, has made the gift to honor and fulfill Hitchcock’s wishes—to establish an endowment, through his estate, that would support poetry-related activities in perpetuity. “George's and Marjorie's commitment to poetry, and their expression of that commitment in the form of this gift, ensure that poetry will thrive at Porter College and at UCSC far beyond the imaginable future,” said UCSC music professor and Porter College provost David Evan Jones. “We can now know with certainty that UCSC will continue to develop its reputation as a nationally-known center for poetry, for arts involving poetry, and for scholarship in support of poetry,” Jones added. Hitchcock taught writing at UC Santa Cruz from 1970 to 1989. In 2002, he created the Hitchcock Poetry Fund at Porter College to support a variety of poetry-related programs and events on campus, including visiting poets, poetry journals, and conferences. Since that time, the fund has galvanized interest and activity in poetry throughout the campus, and increased UCSC’s profile as a center for contemporary poetry--representing a wide variety of approaches. The George P. Hitchcock Modern Poetry Fund endowment will provide support for a broad range of projects related to modern and contemporary poetry—including residencies for poets, readings, commissions for song cycles, a poetry prize, and support for performances of poetry-related projects in theater, music and art. Through this gift and his far-reaching vision, George Hitchcock will continue to foster and support countless innovative poets long into the future.